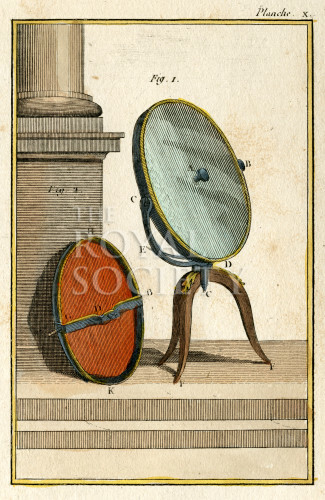 Study of a circular, concave burning glass, or Archimedes’ mirror, with a central screw and presented on a tripod mount. The reverse of the mirror is shown leaning against a pillar. Plate 10 from the book Histoire naturelle, généralle et particuliére…Nouvelle edition, by Georges-Louis Leclerc, Comte de Buffon and C.S. Sonnini, volume 5 (Paris 1799). The accompanying text describes the mechanism as: ‘Miroir de réflexion rendu concave par la pression d'une vis appliquée au centre’. (Reflecting mirror made concave by the pressure of a screw applied to its centre).